I found this super cute stamp set at Michaels one day on sale and could not resist. It has been sitting in my stash for a couple of months and my sister Barb who purchased the same set challenged me to use it at the same time as her. I had a vision, it did not quite work out as expected but I think it is sweet. I die cut and masked the avocado pair then added some ink blending, stacking them twice. I added some bright ink blending as the base and added some flicks of water for interest. I added some Wink of Stella to the hearts then covered one with Glossy Accents. I finished with the sentiment and some Nuvo drops. 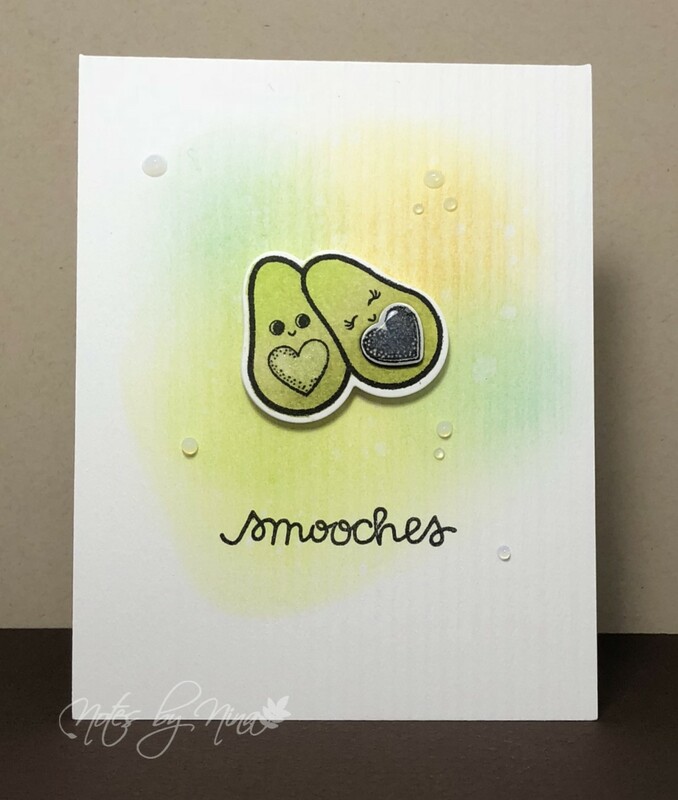 Supplies: White cardstock, Recollections - Valentine's Day, Paper Smooches - Chit Chat, Nuvo drops. Your 'cados make me smile - I love your freeform, soft artistic background colors. They make your 'cados stand out! Super sweet card Sis! Glad we broke these stamps out, I have ideas for the others too!